You asked for it, and this year we’re making it happen! 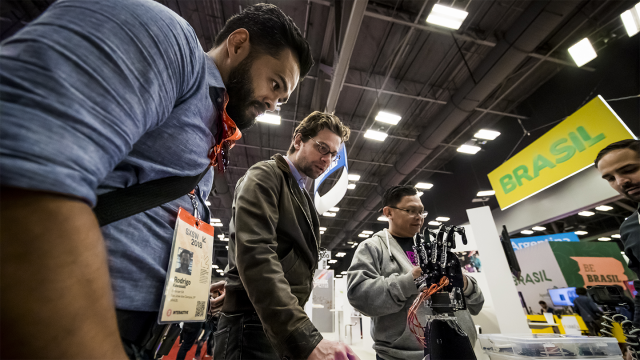 The epicenter of business, and the biggest exhibition at SXSW, is getting even bigger — the SXSW Trade Show is expanding by nearly 40% in 2019. The Trade Show runs March 10-13 and this expansion means new pavilions devoted to trending industries, more creative innovators, and even greater opportunities for returning businesses and organizations as well as those currently thinking about joining us for 2019. In fact, we are still looking for more creative companies and forward-thinking innovators to apply to participate! In 2018, there were 735 Trade Show spaces from 27 different countries, with over 75,000 people in attendance. The Trade Show saw exhibitors including Kuka Robotics, Experimental Aircraft Association, Institute for Quantum Computing, Briggo, Rise Against Hunger, Indeed, Audio Technica, Lockheed Martin, Mitsubishi Electric Corp., Shure Inc., Taylor Guitars, and countless others. See the full list of 2018 exhibitors here. Come & Capture highlights the evolving landscape of digital filmmaking, featuring new tools that manufacturers, filmmakers, and app developers are using to capture and create content. Next Stage holds presentations and performances showcasing emerging talent participating at SXSW, including cross-industry panels with diverse speakers and intimate showcases from official SXSW artists. Startup Village puts the spotlight on some of the brightest up-and-coming businesses from all industries and sectors including mobile apps, 3D printing, FinTech, and more. Style Lab focuses on wearable technologies, fashion apps, the future of retail, and innovative design, as well as the intersection between fashion and technology. See a list of announced Trade Show areas here. Make sure to stay tuned for more updates on the Trade Show throughout the Fall!